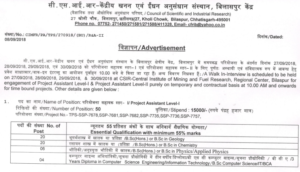 CIMFR Project Assistant Level I & II Recruitment 2018: 67 Job Vacancies – Board of Controller of Exams, CSIR-Central Institute of Mining and Fuel Research which is a research institution in Dhanbad, Jharkhand has released an Advertisement on 11th September 2018 which as scrutinized and verified by responsible authority on 8th September 2018. 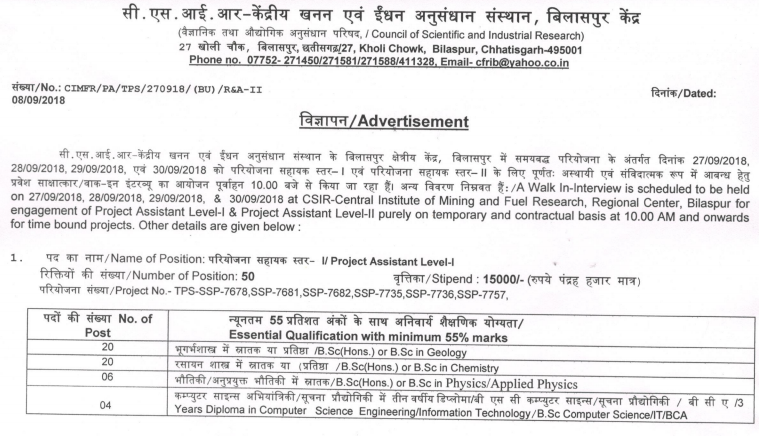 Advertisement states that A walk in interview is scheduled to be held on 27th September 2018, 28th September, 29th September and 30th September at CSIR – Central Institute of Mining and Fuel Research, Regional Center, Bilaspur for engagement of Project Assistant Level 1 & Project Assistant Level II purely on temporary and contractual basis at 10:00 AM onwards for time-bound projects. While stipend is just the opposite of a number of vacancies. As Rs. 25,000/- for 17 vacant posts of Project Assistant Level II and Rs. 15,000/- for 50 vacant posts of Project Assistant Level I. Most common part of both the vacancies recruitment is that55% minimum marks are required in Education Qualifications. In case of Project Assistant Level 1, Bachelor of Science (Hons.) or Bachelor of Science in Geology is required. While for the next 20 vacancies same is required for Chemistry instead of Geology. And for the next six posts, same is required for Physics/ Applied Physics.